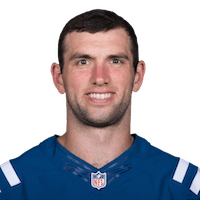 Published: Jan. 5, 2019 at 05:42 p.m.
Indianapolis Colts quarterback Andrew Luck dials up a touchdown toss to wide receiver Dontrelle Inman to give the Colts a three-score lead. Published: Jan. 5, 2019 at 05:14 p.m.
Indianapolis Colts tight end Eric Ebron stiff-arms Houston Texans safety Tyrann Mathieu on this touchdown catch and run. Published: Dec. 30, 2018 at 10:17 p.m.